✟ ≠ 26147 C.Q.M.S. R.G.A. Frenchmans Battery, South Shields. He was almost certainly a soldier before the outbreak of war. 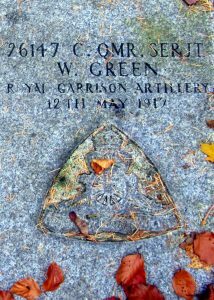 He died 12/5/1917 (age 40) at No 2 General Scottish Hospital, Edinburgh. Grave; Edinburgh (Comely Bank) Cemetery., where his wife is shown as Sophia D Richter (formerly Green) of South Africa. There is an Ancestry record for William Green b 1877 Grindleford Bridge, (although shown b 1877 Kingston, Staffs per 1881C and 1911C. 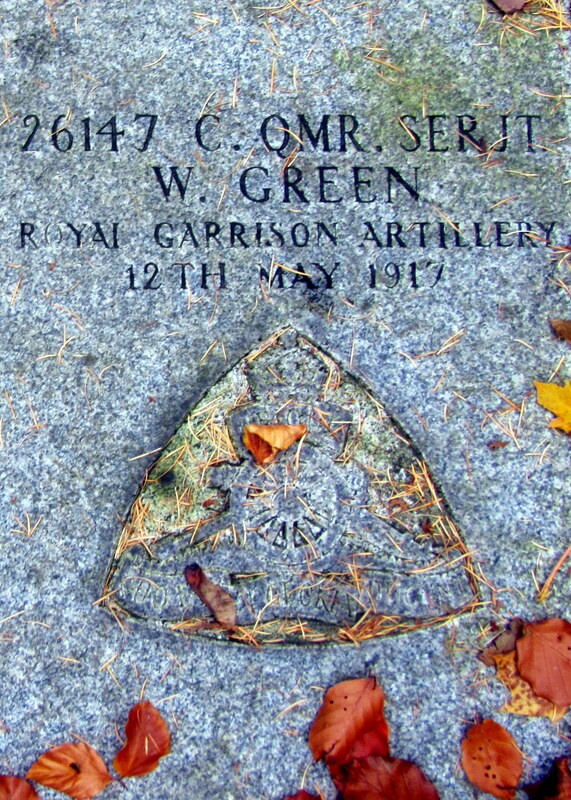 Son of John and Harriett Green, brother of Ernest Josiah. 1881C the family are living at Grindleford Bridge. 1891C Harriet Green and family (but not William) are living at Old Dale, Hathersage. William listed himself as from Hathersage working at Bradfield.